Home / Reviews / Stay Cool And Protect This Fall With CoolHeadS! It’s almost football season and with many of us getting groups of friends together to throw the ball around, it’s time we find a solution to the dreaded sunburn and heat exhaustion at comes with hours of being outside. While hats protect the head from sun exposure, what about the shoulders and back of the neck? Introducing CooLHeadS, the fashionable and unique headwear that provides 100% sun protection for your head and neck area, including the sensitive shoulder area, while keeping you cool. From playing a game of golf to just enjoying a sunny day at the beach, CoolHeadS has got you covered. You can now get out and enjoy the gorgeous weather with the one and only CoolHeadS. Made from 100% ultra-soft and absorbent terry cloth, CoolHeadS are designed to fit comfortably and stay on your head using a unique inner band system. 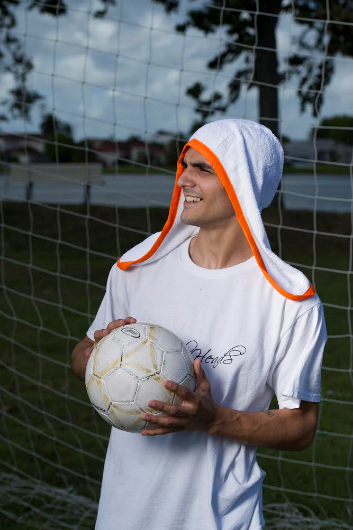 Half towel and half hood, the stylish headwear not only provides complete protection from the sun’s harmful rays, but it also absorbs sweat! A colored cloth trim, available in seven different colors, accent the bright, sun-reflecting white terry cloth and help regulate the body’s temperature and keep you cool. With a $19.99 price tag, staying protected and cool this summer won’t break the bank either! Head over to their website, www.getcoolheads.com, to purchase the fun and fashionable headwear. Take a look at their line of snap-backs and accessories while there too! Now get outside with CooLHeadS!